Eco friendly products here include,tastefully designed and beautifully handcrafted fashion jewellery in colourful,vibrant and mixed array of colour and material. Trendy pieces of jewellery that add a dash of oomph to your look. Our cart also includes handmade Key chains, handcrafted accessories and other gifting items which are one of its kind and tastefully designed, remain easy to maintain and yet affordable. You can help us initiate this innovative approach of bringing art to people. It is a hand built cart selling straight from the artists products to grace your friend or loved one with lovely gifts. Art Cart will constantly showcase an array of new products so keep your eyes out for updates! Eco friendly products here include,tastefully designed and beautifully handcrafted fashion jewellery in colourful,vibrant and mixed array of colour and material. Trendy pieces of jewellery that will add a dash of oomph to your look. 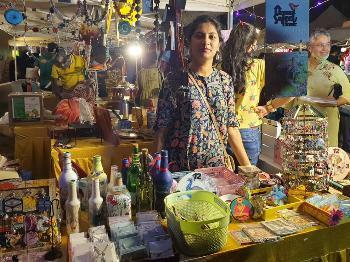 Our cart also includes handmade Key chains, handcrafted accessories and other gifting items which are one of its kind and tastefully designed, remain easy to maintain and yet affordable. *Delivery of items to buyers located in places where octroi or other local taxes and levies are charged will be liable to pay the same to the courier company even though the listing mentioned no such octroi, taxes or levy. *Exchange only if damage and genuine defects. *All requests for return of product have to be placed within 48 hours from the date of delivery. No return requests after 48 hours from delivery will be processed. *All items must have the original security tag and label and must be returned in the same conditions as delivered by the Company.